Pseudoscience at a Science Museum? During a recent visit to Dallas’ new science museum, Tim Crookham, found some pseudoscience in the museum’s gift store, and he brought it to the museum’s attention. The following is his account of what happened. On Saturday, March 9th, I went down to the Perot Museum of Nature and Science. 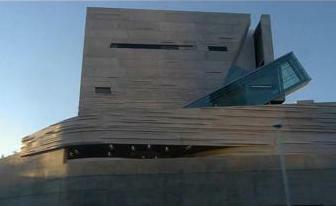 It’s a new museum that opened in Dallas in December of 2012. At the end of my visit I stopped by the gift shop. While looking around the museum store, I saw a necklace in a box with the words “Titanium Sport Energy Necklace” printed on the box. It looked like the braided necklaces I’ve seen baseball players wear. I picked up the box and the description on the back read something like “works with your body’s energy field to increase energy and promote well-being.” It also had things like “good for those with back pain and poor circulation”. I’ve seen enough Randi talks, Penn & Teller B.S. shows, and Richard Saunders clips that the skeptical alarm bells were ringing loud and clear. I was both shocked and disappointed that this found its way into the museum. I tried to find an employee to tell, but the store was packed. I came across some alternative medicine pseudoscience being sold at the Perot Museum Store and was shocked and disappointed. The item that caught my attention was the Titanium Sport Energy Necklace. This item claims to work with the body’s energy field to increase energy and promote health. There is no scientific evidence to support those claims. 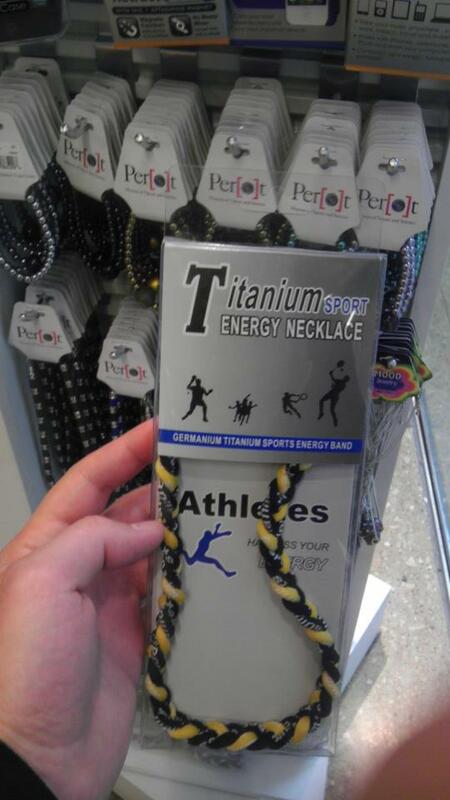 As a member of the Perot Museum, I request that Titanium Sport Energy Necklace and any other pseudoscientific merchandise be removed from the museum store so as to align the store with the scientific mission of the rest of the museum. Below are articles regarding energy necklaces and their lack of scientific support. Yay for science and skepticism!!! Power bracelets for sale, capitalism meets new-age. This is from the North Texas Skeptics Travel and Amusement section. OK, so there is no Travel and Amusement section, but there should be. Especially the amusement part. 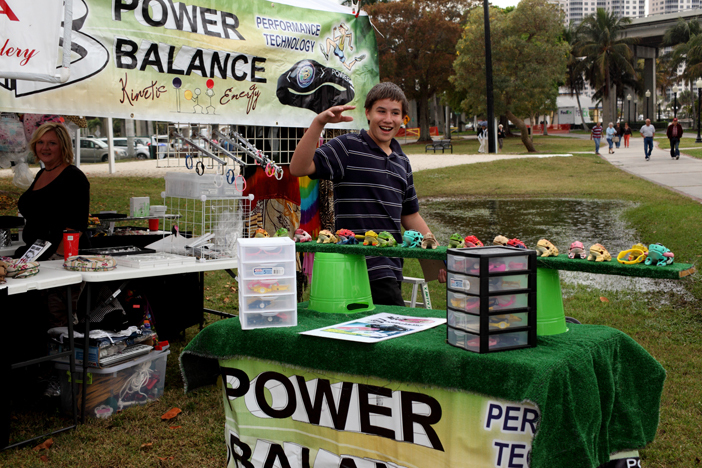 On vacation in Fort Myers, Florida, we met up with some friends and stopped by a crafts fair going on near the river front. Lots of good stuff, including handmade soaps, peanut brittle and the usual fair fare. Plus power bracelets. I’m getting old and a bit cynical, and it seems nothing is new to me. So when I saw this booth the entire scenario played out in my mind before it played out in the real world. The following dialog is barely approximate. He hands me one, and I’m not supposed to put it on, just hold it in my left hand. I have to put my camera down first, lest it be damaged by the power. I am then expected to stand on my left foot only and extend my right arm. He’s going to press down on my right hand. Jesus, how far back did I see this coming? He takes the bracelet (my left hand is now empty) and presses down. No way can I keep from dropping my right arm or else falling down. Then I take the bracelet in my left hand, and he prepares to press down on my right. I swear to Jesus I know exactly what is about to happen. Sure enough, as soon as he starts to press down I drop my resistance and allow my right hand to be pushed down. He immediately senses I am dropping my resistance, and he immediately quits pushing. My right hand is not supposed to go down while I am holding the bracelet in my left hand. It’s his job to see this does not happen. We go through this charade a couple more times, and I cannot resist a laugh. He is puzzled and becomes even more puzzled when I remark, cryptically, “You have no idea just who you are dealing with.” I promised him his picture would be posted on the Internet and went off to join my friends. I’m telling you, Skeptics, it’s out there, it always has been and it always will be. There is just no end to the fun.